Yes, I know, I’m a little late this week! My apologies, but here we go. ‘Il Fonti’ the winning team. 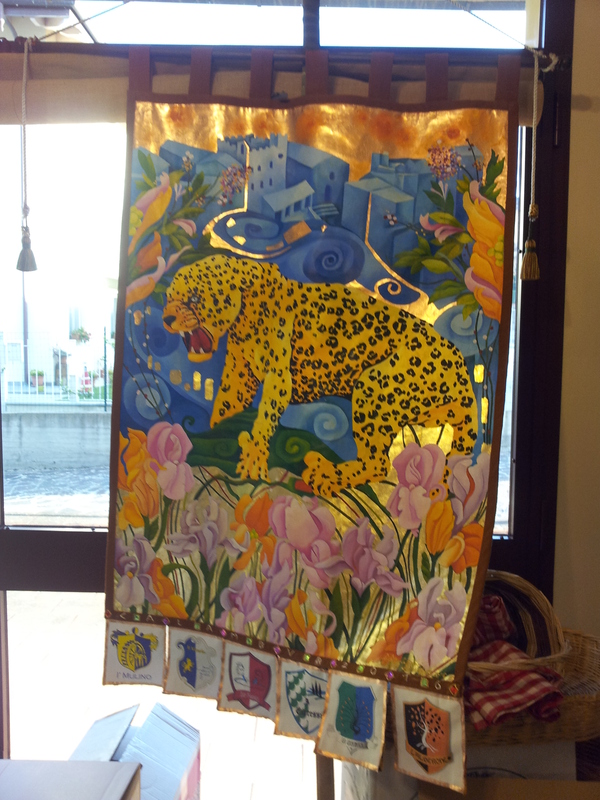 The victor’s beautiful Banner on display at Fiano. The highlight of last week was Fiano’s victory in the ‘Calambur’. Just to explain, the Commune di Certaldo is divided into five ‘villages’ so to speak and all have their own flag. These are really districts and every member of the commune belongs to one of them. Fiano is the main village in ‘Le Fonti’ and the team was made up of many friends and family from Fiano, our local village. 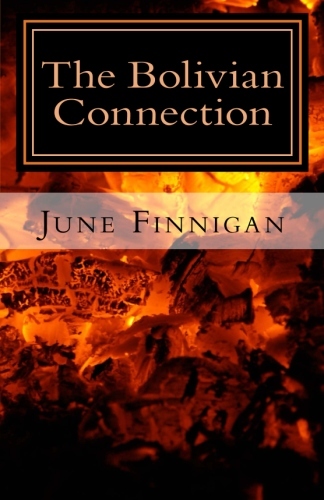 ‘So what’s it all about?’ you ask. Well the teams compete against each other in a complicated day of races, obstacle courses and intelligence tests, hoping to win the coveted Victory Banner. 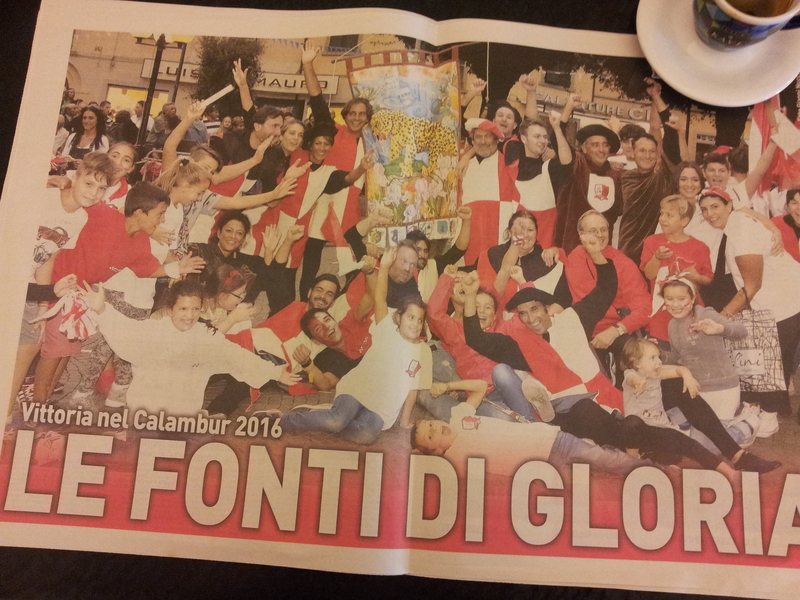 Well, guess what, our team won and the beautiful banner has been on display in La Dispensa, our still fairly new bar and alimentare, in Fiano. It really is a beautiful thing and I have enclosed a foto for you to see. Wow! Well, what next? Oh yes, the olive harvest. The grape harvest has been going full pelt since the beginning of September and is the busiest time of year for the country folk. Then it’s the turn of the olives and the countryside changes once again as multi-coloured nets are spread around the olive groves. 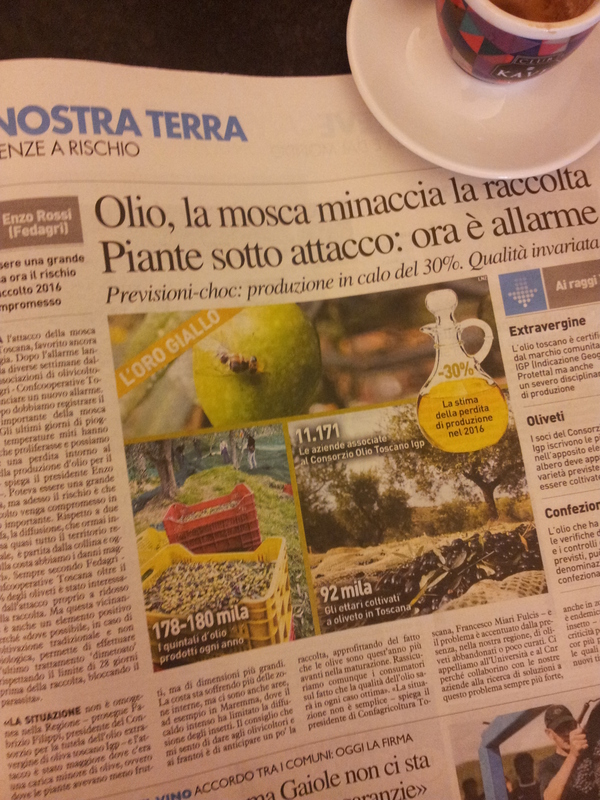 Sadly, I read in the paper that the production is estimated at 30% down on last year due to the pesky olive fly. So the price of Extra Virgin will likely be higher in the coming months. Whilst we love freshly cold pressed oil, we still have a huge demijohn from last year in the cantina, so we won’t go short. The Mayor of Rome, Virginia Raggi, makes the announcement. La Repubblica. 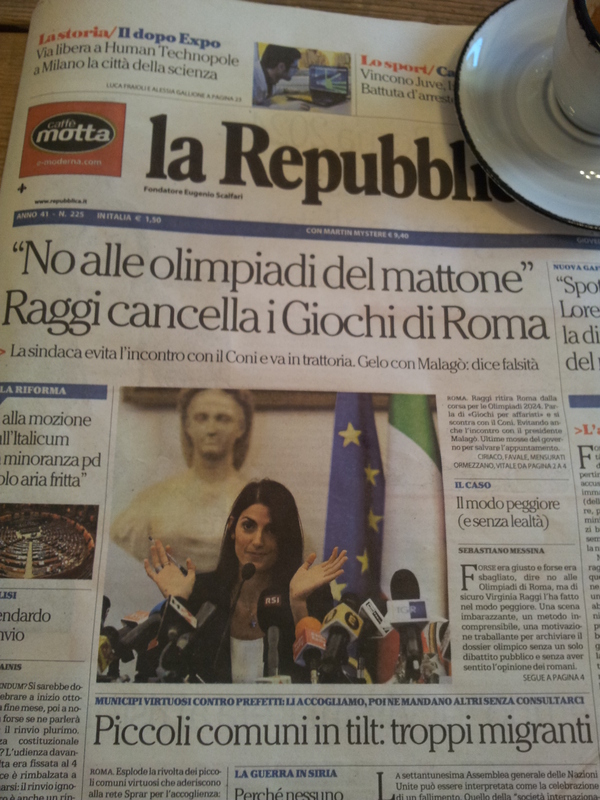 Meanwhile, down in Rome, there has been a big debate about whether the City should host the 2024 Olympic games. Now I am a great one for sport, but when I read the announcement from the Mayor of Rome, Virginia Reggi, that the city was withdrawing from the race, I was quietly pleased. The locals all talk about the lack of money spent on long-term employment, pensioners and the country’s infrastructure. So good for Virginia and the Romans, lets see some government reaction and some more money put into the economy! 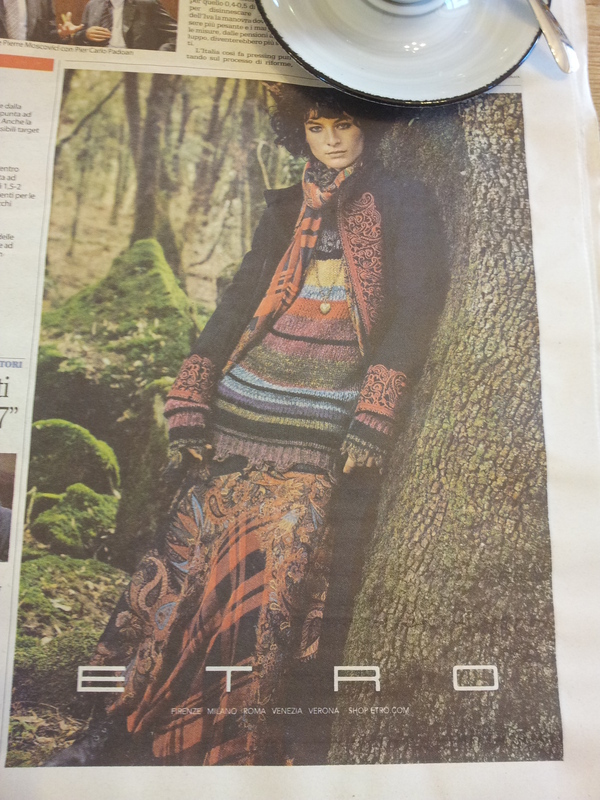 Autumn Italian Fashion, beautiful. La Repubblica. Anyway, back to my world and fashion. Yes I know, I’m a great lover of handbags, scarves, shoes and gloves and this time of year it’s all about autumn colours too. Then of course, we have the wonderful sunsets as the sun has slipped lower in the sky, or has the planet moved up a shade? Probably the latter. I sat out on the lower terrace yesterday evening and not one mosquito! So the imminent arrival of house guests will be pleased to hear that. August and most of September kept us inside in the evenings to avoid getting bitten, so we’re looking forward to enjoying aperitivi outside. OK, enough of that. 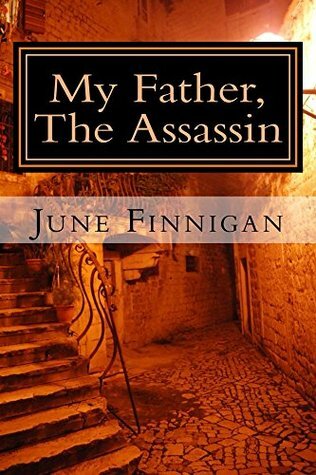 Must crack on with the day job and the thousand words a day for my third book in the Joanna Wilde trilogy, which I know you are desperate to read!